There are 284 articles in this category. 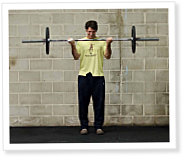 Nothing wrong with barbell curls, of course, but if you’re writing an article on identifying quality personal trainers, leading with an oiled-up bro-session curl shot does little to set the table and create an atmosphere of professionalism. How to select the right eggs, whether you’re interested in nutrition, animal welfare or price. For years I’ve purchased brown eggs. Specifically, Trader Joe’s Brown Organic Free Range Eggs. I bypassed the cheaper options because it seemed like the healthy thing to do. I had the vague sense the brown color meant they were healthier, more natural, but I couldn’t tell you what any of the claims on the carton actually meant. Thomas Seyfried, Dr. Eugene Fine explain how cancer is affected by sugar, insulin and inflammation. Accounts of deadly tumors date as far back as 3,000 B.C. in ancient Egypt. Yet despite centuries of study, cancer is—after cardiovascular disease—the world’s second-leading cause of death, claiming more than 8 million lives in 2012 alone, a number that’s expected to nearly double over the next 20 years. Dr. Eugene Fine and Thomas Seyfriend talk about the links between sugar and cancer. This year, 1,685,210 people in the United States will get cancer; 595,690 will die from it. It’s the second-leading cause of death after heart disease, responsible for nearly 1 in 4 deaths in the U.S., and researchers have spent lifetimes studying its countless mutations in search of a cause, pointing their fingers mostly at genetics and physical, chemical and biological carcinogens. 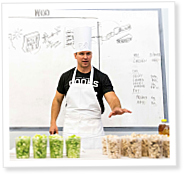 Chef Nick Massie teaches athletes how to mix their macros for delicious fare that supports a healthy lifestyle. Phillip Gomez used to suffer from mageirocophobia—the fear of cooking. “I thought cooking was hard. 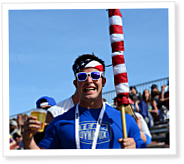 I didn’t know how to cook, so it seemed like a waste of money because I figured I’d mess it up,” said Gomez, a police officer and coach at Turn 2 CrossFit in Murrieta, California.